Armed and highly trained soldiers from the Belgian anti-terror corps and police paid a visit to the 'Esvagt Mercator'. Working with fast rescue boats and transfer boats is ordinary work for ESVAGT, but not when the boats are filled with 16 armed and highly trained soldiers from the Belgian anti-terror corps and police. When these specialists are accompanied by two warships and two attack helicopters with even more soldiers on board whose intention is to attack ESVAGT, it – thankfully – becomes a far cry from the ordinary. 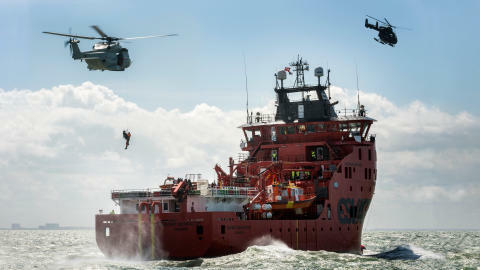 This, however, was the programme that awaited the ’Esvagt Mercator’ Wednesday last week when the vessel took a brief break from its work in the Belgian offshore wind farms, Nobelwind and Belwind, to assist the Belgian anti-terror corps in an exercise. During the exercise, the ‘Esvagt Mercator’ was hijacked outside the port of Ostend, after which units from the anti-terror corps boarded the vessel, freed the ’hostages’ and neutralised the ‘terrorists’. “It was very exciting to be part of the action. A veritable sea of hands was raised when we were asked whether we would like to be hostages,” says Rasmus Carlsen, captain on the ‘Esvagt Mercator’. He, together with his chief officer, engineer, and MHI Vestas’ supervisor, were the only four on board who were not part of the exercise. 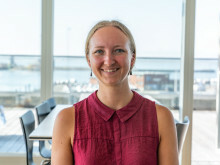 “A few people didn’t participate and there were areas of the vessel that were cordoned off, but otherwise the rest of the vessel was available for the exercise,” says Rasmus Carlsen. ESVAGT has taken part in similar exercises before – the ‘Esvagt Kappa’ for example took part in a training exercise with the Danish Frogman Corps in the North Sea in 2015.